On the Fox TV channel, Seth McFarlane's series The Orville is well into its second season of science fiction. For those of you not familiar with this show, I can concisely summarize it in this way: it's a Star Trek clone. The characters wear uniforms that look like the uniforms in Star Trek. Just as in the Star Trek series, we see the adventures of a large spaceship (called the Orville after Orville Wright) that travels from solar system to solar system with incredible speed and ease, like some jet traveling around from city to city. It's a very entertaining show with some good production values and special effects. As in Star Trek, the crew is composed of members from different planets. In the series, interstellar travel is so easy that when some crew member has a personal need to return to his solar system, the ship's captain (played by Seth McFarlane) sometimes says that's no problem, and the whole star-ship (the Orville) goes to that planet. This kind of “interstellar spaceship as personal taxi cab” idea is quite contrary to physical reality as we currently understand it. Given the fact that the nearest solar system is four light-years away, humans will be lucky if they can ever travel from one solar system to another in less than ten years (since traveling at even a half of the speed of light seems to tax the limits of engineering possibility). As in Star Trek, the crew members of the Orville almost never seem to change their dress when they go into extraterrestrial planets that might have vastly different atmospheres and temperatures, and they conveniently find that the residents of these planets can always speak perfect English without even an accent. 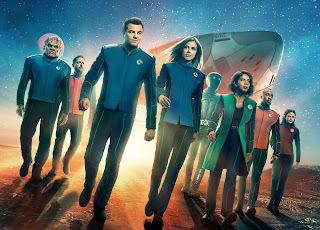 In the episode, the main members of the Orville's crew arrive on a planet in another solar system. They find that the planet is run by believers in astrology who put people in concentration camps if they are born under the wrong astrological sign. Two of the Orville's crew members are found to have been born under such a sign, and are sent to a concentration camp. Near the climax of the episode, we see the crew members tied to poles. They are just about to be executed by the evil believers in astrology. Then, through some technological magic arranged by the good guys, they are saved from execution. None of this has the slightest basis in anything that has ever happened. There is no case of a government ever having had a state religion based on astrology. There is no case of people ever being killed, injured or imprisoned by an astrology believer because they did not believe in astrology or were regarded by an astrology believer as being born under the wrong astrological sign. Below is a comparison between astrology as depicted by The Orville and the historical reality. Astrologers put people in concentration camps or try to kill them because of reasons pertaining to astrology. There has never been any significant persecution or violence performed by astrologers based on anything having to do with astrology. Astrologers have caesarian sections so that a baby won't be born under a bad astrological sign. They do not do such a thing, and do not believe any of the 12 zodiac signs is a bad sign to be born under. Astrologers think that people born under a particular astrological sign are dangerous or inferior. Astrologers do not believe that any of the 12 astrological signs is “bad.” They may think that there are pros and cons and strengths and weaknesses in each of the different astrological signs. The episode I just discussed is one of several episodes of The Orville in which religious believers are depicted as murderous oppressors. In the Season 1 episode "If the Stars Should Appear," there is a theocratic dictator, Hamelac, who "violently imposed rule and religious adherence through his government"; he was "especially concerned about finding, torturing, and then killing suspected members of the Reformers" (according to this summary). The Orville has recurring appearances of a race called the Krill, who worship a deity named Avis who they believe has instructed them to kill all other races except their own. There is no historical parallel for the Krill, but we can imagine an episode of The Orville that would be strongly based on historical reality. In the episode the captain of the Orville and some of his crew members would travel to a planet on which atheists had declared that all religious belief was forbidden. They would find that very many thousands or millions of people on the planet were being put in concentration camps or slaughtered because they held a religious belief. Such an episode would be strongly rooted in the historical reality that massively occurred under the communist Soviet Union, communist Cambodia and Maoist China. But I don't imagine we will ever see such an episode on The Orville. "During the purges of 1937 and 1938, church documents record that 168,300 Russian Orthodox clergy were arrested. Of these, over 100,000 were shot." Similarly, a CIA document refers to attacks by the Red Guard in Maoist China that "spared no religious group in China." The most recent episode of The Orville was a very charming one about a romantic relationship between a woman and a robot. It's episodes like that which make the series worth watching.